«He’s Got His Act Together: Standing Pat on Guantanamo? Two years ago, I published an analysis of Hannah Arendt in Tikkun (“Hannah Arendt: From Iconoclast to Icon“). As I had suspected, the new film (“Hannah Arendt”), which debuts commercially in New York today (May 29), lends credence to the simplistic notion that her controversial portrait of Adolf Eichmann at his Jerusalem trial was a mark of great insight. She didn’t merit the abuse that she suffered as a result; she was not intending to be hateful or to excuse the Nazis, but her most significant conclusions were drawn from the very limited range of Holocaust scholarship available to her in the early 1960s. Eichmann was not simply the dutiful amoral bureaucrat as Arendt had portrayed (and her notion, brought up in the film, that he wasn’t personally antisemitic, seems ridiculous to me). Nevertheless, I liked the film; I found it intelligent overall and absorbing. But it reinforced my view of her cold abstract intellect, and the ways in which her book failed factually. Still, if her thesis was so simple as to suggest that ordinary people (and therefore everybody) is potentially capable of great evil, she’s correct. Yet Eichmann was only ordinary or “banal” (as the book contends) to a high-toned intellectual. He was brilliant and aggressive in pursuing his diabolical task to facilitate genocide, and he knew exactly what he was doing. And her controversial discussion of the role of the Judenrate (Nazi-appointed Jewish Councils) was not reflective of the range of reactions that members of the Jewish Councils made to Nazi commands — from ruthlessly pragmatic compliance to the Nazis’ impossible demands, to outright resistance (almost always resulting in immediate execution) or honorable suicide. But she may well have been correct in her bold (and hated) contention that had the Jewish Councils not existed, or if most Jews had not followed their instructions and not identified themselves, many more would have saved themselves. She does not consider, however, that hiding their identities, or going into hiding — especially in countries where Jews were disliked — was not easy. There’s a certain popularity in some left-wing quarters to extol Arendt as an anti-Zionist, but this is not true. In one scene, the film implies that she had only been a Zionist in her youth, which is not accurate either. 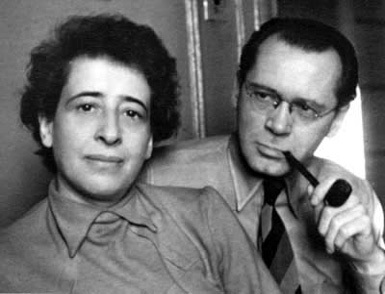 The fact is that Arendt was a Zionist activist at least until 1942, when the World Zionist Organization voted to seek a Jewish state. Arendt was part of the liberal bi-nationalist stream within Zionism that bitterly opposed this decision. And I saw a video clip at a conference on Arendt at New York University in 2006, which shows her being interviewed on West German TV in 1970, in which she declared her work for the Zionist movement in Paris in the 1930s, helping young German and Polish Jews reach safety in Palestine, as the achievement in her life she was most proud of. She was not merely a Zionist as a “youthful folly,” but a mature adult in her middle thirties when she vociferously objected to the decision of the Zionist movement in 1942 to adopt the “Biltmore Program,” to make Jewish statehood in Palestine the official Zionist objective. It’s fair to say that at some point after that, she ceased being a Zionist activist, but had been an active Zionist well beyond her involvement in a youth group, as the film had inaccurately implied. Still, I am satisfied by the detailed response that I received from the director and her co-screenwriter that they’ve made a conscientious effort at creating a meaningful and truthful film. If this subject interests you, it’s worth seeing, not just for the intellectual and historical issues raised, but for the portrait drawn of Arendt as a person, including a taste (a mere taste in flashbacks) of her complicated relationship with Martin Heidegger, her academic mentor who became her lover and then a stalwart of the Nazi regime; and a sense of her marriage to Heinrich Blücher, a self-educated German revolutionary and intellectual who (although not Jewish) became a Zionist in his youth and then a fixture in the German-Jewish exile community in New York. Postscript: The film’s dialogue is a mix of English and German, with a tiny bit of Hebrew. I was amused (as were others in the audience) by a scene in Arendt and Blücher’s Manhattan apartment when Blücher, discoursing intensely in German with their German-Jewish friends, casually interjects the Yiddish word, mishugena (crazy).